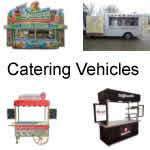 A range of mobile catering vehicles to help you get started in your mobile catering business. Purpose-built and certified catering vehicles include a range of quality catering trailers, catering vans, catering carts and catering kiosks. All vehicles can be created and designed around any type of catering business: coffee, burgers, crepe, waffle business. The vehicles meet strict build guideline and UK/EU regulations. Which means they are roadworthy and legal and meet the necessary insurance, event organisers and local council requirements. Browse a selection below and if you don’t see what you need, please contact us here.